OMG! 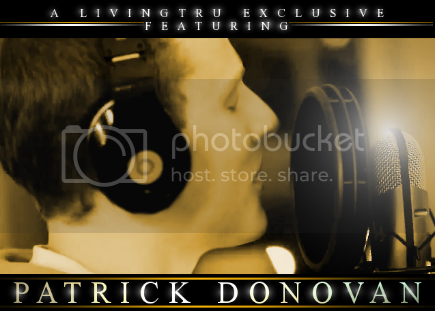 LivingTru.com has got, Musician, Patrick Donovan in the house! Its been a roller coaster ride getting this feature together, but well worth it!!! “I am your thunderstorm and you are my fire…” talking about some epic love! This song should be an anthem to all relationships and knowing when to let go! It’s hot, its cold, its tumultuous, and its passionate! Kudos to Patrick and his love of music and a big SHOUT OUT to the, lyricist, E-HOS and the gang! Read on if you want to see what all the hype is about! We've had a few hits and misses, but now we're on track! Its really nice talking to you Patrick, lets get started! Where do you get your music influence? I've spent my whole life listening to music, as I was introduced to it at a young age, and I got a lot of influence from that. I was also influenced to get into music by my mom and my grandpa who were both incredibly talented musicians. Cool! I find that most artists have someone in their family who is musically inclined, lol. How long have you been a musician? In 4th grade I started playing the Saxophone; from there I fell in love with creating music. It gradually turned into playing guitar, piano, singing and songwriting. But I've been making music for a very, very long time. Wow! You have a lot of skills going on, I like that! 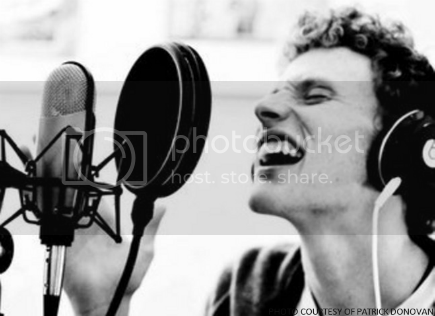 Have you always wanted to perform professionally? I've always dreamed about it, but it wasn't until last year that I thought about seriously considering, or pursuing a profession in music. It's a tough industry but I would kill to be a part of it. Lol. I feel it, but don't hurt nobody, lol! Seriously though, did you come from a musical household, if so, what was it like growing up? I don't think I've ever had a day in my life where I didn't hear music. My dad is a music lover, as is my mom who also played piano for years. My sisters and I were all in band in school, so music was always in the house. I found lots of inspiration in all of the different kinds of music that I was exposed to at such a young age. That's cool that you and your sisters share the same heart for music. And, having parents who love music only intensifies your awareness of how important it is. What is some of the best advice your parents ever gave you? My parents have always told me to just be myself. The reason this has become such important advice is that, as a songwriter, without being honest you lose the entire sense of the art form. The minute you write a song you can't relate to is the minute you've settled for something that isn't what the art is about. It's about expression, and expressing yourself is hard to do if you're not being yourself one hundred percent. So true! Music is definitely the art of expression and it is a very communicative device that draws people together. Its powerful! And its just my opinion, but I think we should utilize it in a positive way. What is it that you would like the world to know about you and your music? If I could tell the World anything about my music it would be, simply, that I hope they can find a connection to it. I like to write about things that are happening or have happened in my life, and it's comforting to hear when someone else is going through or has gone through the same thing. Even if it's not a great thing, it proves that we're not alone. Eloquently put! And I totally agree! So, what do you think you can contribute to society to help make it a better place? Music has powers that people underestimate incredibly. If I could share a song with someone and have it make their day a little bit better, or have it change the way they think about something, then that's a contribution. Even if it's tiny, I like knowing that I might be making a difference. Cool, I would say that is definitely the effect of "positive energy," something that we at LivingTru greatly care about! Where do you see yourself, musically, 5 years from now? Still playing and still writing. Even if I end up graduating and going to grad school or getting a job in business, I don't think I'll ever stop making music. It's like my therapy; I honestly don't know what I would do without it. By all means, please don't stop, especially if you can help others! Lol! And, as I mentioned in the previous paragraph, "positive energy" is something we relish...What do you consider "Positive Energy" to be? I think that positive energy can be found in anything that puts a smile on someones face. It can be found in virtually anything, you just have to look hard enough to see it sometimes. Thanks Patrick! It was cool getting to know you and how you feel about life in general. Keep making music! And if you do end up in grad school or working in a profession outside of music, don't forget to take that "positive energy" with you! Guys be sure to connect with Patrick on all of his social networks and his website! Also, don't forget to check out the new video by E-Hos, "Let it Go" featuring Patrick! This is the Jam! Really. Great music! Keep it up!! You are an awesome musician & person!! !